The University of Tokyo (東京大学, Tōkyō Daigaku; abbreviated as 東大, Tōdai) is one of the leading research universities in Japan, producing top officials for the central government of Japan as well as leading scholars in all fields. The university is perceived by many Japanese as the best gateway to success in bureaucratic careers, particularly for central government agencies and in top enterprises. The university has produced many Japanese politicians including several prime ministers. It is one of the seven universities which were Imperial Universities before World War II. Rival Kyoto University celebrates free spirit, promotes individual creativity, and it has produced more top scientists and Nobel Prize winners; however, according to the Institute of Higher Education the University of Tokyo is ranked the best in the Asian Pacific Region. The university has three major campuses in Hongo, Komaba, and Kashiwa, as well as two smaller campuses in Shirokane and Nakano and other facilities outside Tokyo. A total of approximately 30,000 students are enrolled, with slightly over two thousand being foreign. The University of Tokyo has the goal of being one of the world's best universities in the twenty-first century, re-establishing faith in knowledge, and cultivating human talent that can contribute to the peace and welfare of humankind throughout the world. The origin of the university goes back to the Institute for Astronomy, established in 1684 by the Tokugawa Shogunate, and the Vaccination Center established by a private medical doctor in 1858. The Institute for Astronomy developed into Kaisei School in 1868. The Vaccination Center became a governmental facility in 1860, then Medical Insitute in 1863, then Tokyo Medical School in 1874. The Meiji government founded the University of Tokyo in 1877, under its current name, by amalgamating Kaisei School and Tokyo Medical School. It consisted of law, science, literature, and medicine departments as well as institutions for Japanese and Chinese literature, occidental studies, and vaccinations. The university absorbed Kobu Daigakko, an engineering college, and it was renamed the Imperial University (帝國大學, Teikoku Daigaku) in 1886, and then "Tokyo Imperial University" (東京帝國大學, Tōkyō Teikoku Daigaku) in 1897. In 1947, after Japan's defeat in World War II, the university again assumed its original name, and at that time it began admitting women. With the start of the new university system in 1949, the University of Tokyo was reorganized with a four-year undergraduate program for most courses of study. In the late 1940s through the 1960s, the department of education as well as institutes for earthquake research, oriental culture, industrial science, social science, journalism, historiography, nuclear study, solid state physics, microbiology, and ocean research were created. In 1953 the university's first graduate school system was established, and in 1965 it was reorganized to comprise ten divisions. In the 1970s and 1980s, the University of Tokyo added considerably to its research facilities, creating centers for nuclear and environmental science, cryogenics and radioisotopes, and laboratories for molecular biology and study of radioisotopes as well as an astronomical observatory. During those decades the university continued to restructure its graduate school and other facilities. In recent years the university has expanded its research even further, to include topics as diverse as artifacts, particle physics, the biology of disease, and economic engineering. The University of Tokyo has since 2004 been incorporated as a national university corporation under a new law which applies to all national universities. Despite the incorporation, which has led to increased financial independence and autonomy, the University of Tokyo is still partly controlled by the Ministry of Education, Culture, Sports, Science and Technology (MEXT, Monbukagakusho, or Monbusho). The University of Tokyo's president, Hiroshi Komiyama, states that the university has the goal "of becoming the 'World's Tokyo University'." He goes on to detail that "it is the mission of the University of Tokyo to present to the world a new model for a university that re-establishes faith in knowledge. Let us put into practice the bold claim that we offer the 'best education and research in the world.' The University of Tokyo will promote excellent research and encourage the integration of the latest expertise in all fields." The main Hongo campus occupies the former estate of the Maeda family, who were the feudal lords of the Kaga Province during the Edo period. 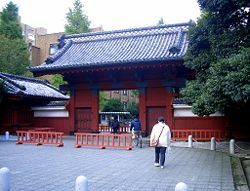 The university's best known landmark, the Akamon (Red Gate), is a relic of this era. The symbol of the university is the ginkgo leaf, which comes from the trees that are abundant throughout the area. The University of Tokyo is composed of three campuses, formulated around a tripolar structure. These three main campuses are Hongo, Komaba, Kashiwa. In addition, other facilities are situated in other parts of Tokyo, including the Shirokane and Nakano campuses, as well as in more distant parts of Japan. Most of the graduate schools and undergraduate departments are located on the Hongo campus. This campus also includes the General Library, Student Counseling Center, and University Hospital. The Komaba campus contains several research centers and laboratories as well as a day care center and many athletic facilities. The smaller Kashiwa Campus houses the Graduate School of Frontier Sciences as well as the institutes for cosmic ray research and solid state physics and other facilities. The Human Genome Center is located on the Shirokane Campus, and the Nakano Campus contains the Ocean Research Institute and Secondary Education School. The University of Tokyo Library consists of three main branches: the General, Komaba, and Kashiwa Libraries. The General Library plays the central role in providing service to all the researchers and students of the university as well as in giving administrative support to other branch libraries. The library houses approximately 1,090,000 books, and its valuable collections attract many researchers in and outside of the university. The library was originally opened in 1878. The smaller Komaba Library mainly supports the studies of the first two years of undergraduate education; and the Kashiwa Library, opened in 2004, is devoted to the natural sciences, functioning as the back number center for those materials. The University of Tokyo also houses more than 60 faculty and institution libraries in various academic fields. The library system at the University of Tokyo has the largest collection in Japan, holding a total of over eight million books. The University of Tokyo Library houses many significant collections. These include the Akiba Collection, nearly 17,000 volumes which list the title and the casts of the Kabuki presented on the stage during the Empo-Meiji eras, and the Katei Collection of Japanese fiction in the Edo period. The library also houses the Ogai Collection, with nearly 19,000 volumes of biographical and historical books, old maps from the Edo period, and European literature, and the Seishu Collection of Chinese classics and Japanese literature. The library also contains a large collection of literature on politics and economic policy during World War II. All persons affiliated with the University of Tokyo are eligible for use of the library. This includes faculty members, graduate students, undergraduate students, auditors, personnel, and others who have been approved by the director. Persons from outside the University of Tokyo, such as former faculty members, personnel, alumni, and others can also use the library for reference only. Inter-library loan and delivery service between libraries in the campuses is available for researchers, as well as for teachers and graduates. The University of Tokyo Library also has extensive online resources. The Online Public Access Catalog can be used by the general public to search the journals and books held in the University libraries. In addition, the online Book Contents Database allows for access to the actual content of the library's books. The library's online resources also include a doctoral dissertation database, a database of newspapers, and a list of microforms held at the library, a catalog of classical Chinese books, and a catalog of historical documents. Sanshiro Pond, in the heart of the university's Hongo campus, dates back to 1615. After the fall of Osaka Castle, the shogun gave this pond and its surrounding garden to Maeda Toshitsune. As Maeda Tsunanori further developed the garden, it became known as one of the most beautiful gardens in the region. It has the traditional eight landscapes and eight borders, but is also known for the originality of its artificial pond, hills, and pavilions. It was at that time known as Ikutoku-en (Garden of Teaching Virtue). The pond's contours are in the shape of the character kokoro or shin (heart), and thus its official name is Ikutoku-en Shinjiike. However it has been commonly called Sanshiro Pond since the publication of Natsume Soseki's novel Sanshiro. The university boasts extensive facilities for athletics and physical fitness, including several baseball grounds and gyms located throughout the campuses. The Hongo and Komaba campuses both contain archery facilities as well as general athletic grounds. Several gyms, volleyball courts, a rugby field, and combat sport gymnasium are also located on the Komaba campus. Finally, the Secondary Education School has track and soccer grounds as well as a swimming pool and tennis courts. The University of Tokyo graduate school of science maintains a botanical garden for botanical education and research. The Koishikawa Botanical Gardens, located in midtown of Tokyo, are open to the public. The Botanical Gardens originated as the Koishikawa Medicinal Herb Garden, which was established in 1684 by the Tokugawa Shogunate. The Botanical Gardens were the birthplace of modern scientific research in botany in Japan after the Meiji Restoration. Research activities are focused on the evolution, phylogenetic systematics, and physiology of higher plants. Field studies are carried out in Japan and abroad, including East and Southeast Asia. Besides the living plant collection, connected to the Botanical Gardens are a herbarium with 1.4 million specimens (including those of the associated University Museum) and a library of 20,000 books and journals. The University Museum is unique, consisting of a system of specialized museums which cover a wide range of fields from paleontology to Andean anthropology. The University Museum is one of the leading university museums in Japan and it tries to make a contribution to science and society in the twenty-first century. By means of making accessible its various collections, the University Museum continues to stimulate academic research. As a public institution, it also strives to make this research available to the wider public, so that society as a whole can benefit. A major task of the museum is mounting exhibitions. The main aim of these exhibitions (small, large, or special), is to present the museum's collections and related research to the public. As such, the museum aims to be a bridge between the university and the public. The academic goals of the university, as stated in its charter, include the pursuit of the highest standard of education in the world through "the pursuit of truth, creation of knowledge, and maintaining as well as developing the highest level of education and research in the world." The university also seeks to nurture leadership qualities in those who "possess an international character and a pioneering spirit," equipping these students with "expert knowledge, comprehension powers, insight, practical strengths, and imagination." Aware of the dynamic relationship between research and society, the university strives "to develop international education and research and accomplish bilateral exchanges with the world," thus contributing to the development of humanity throughout the world. While nearly all academic disciplines are taught at the university, it is perhaps best known for its faculties of law and literature. Admission to the University of Tokyo is quite competitive. In 2005, there were over 14,000 applicants for just three thousand spots. The university offers deferment or exemption from tuition for students who have difficulty paying and who have shown considerable academic promise, or for students to whom extenuating circumstances apply. The university currently employs around 2,800 faculty and has 30,000 enrolled students. Some 2,100 of these students are foreign, which is a large ratio by Japanese standards. Over 42 percent of the foreign students who study at Japanese language schools are in Tokyo. Students organize two annual festivals: the Komaba Festival in November on the Komaba campus, and the May Festival (Gogatsu-sai) at the Hongo campus. Additionally, an annual event invites high school students from all over Japan to visit the university and have an experience of university life. Does the University of Tokyo live up to its president's claim of presenting "a new model for university that re-establishes faith in knowledge"? Its extensive facilities for research and education have grown in recent years to explore an astonishing variety of topics, from economic engineering to climate research. The university established a center for collaborative research in 1996, and has been taking steps recently to increase the courses of study available for graduate and undergraduate students. However, if the university is to live up to its goal of becoming "the World's Tokyo University" then its proportion of foreign students needs to increase. University of Tokyo alumnus and professor, Masatoshi Koshiba, won the Nobel Prize for Physics in 2002. This accomplishment, as well as the successes of numerous other alumni, testifies to the excellence of education offered at the university. The University of Tokyo is well on the way to living up to its goals, but it remains to be seen if it will be counted among the world's best universities in the future, and "cultivate human talent that can contribute to the peace and welfare of humanity." History of "University of Tokyo"
This page was last modified on 11 January 2016, at 16:47.